What is Swift Data Types? While performing programming in any programming language, you require to employvarious types of variables for storingdata. Variables are reserved memory locations for storing values. This means that when you create a variable, you willallocate some space in the memory. You may want to store data of different data types such as string, character, integer, floating point, wide character, Boolean, etc. depending on the data type of a variable, the OS willassigns memory and determines what could be stored in the reserved memory. What are Built-in Data Types? Int or Uint − This is employed for whole numbers. More specifically, you mayemploy Int32, Int64 for defining 32 or 64 bit signed integer, on the other hand UInt32 or UInt64 for defining 32 or 64 bit unsigned integer variables. For instance, 42 and -23. Float - This is employedfor representing a 32-bit floating-point number as well as numbers with smaller decimal points. For instance, 3.14159, 0.1, and -273.158. Double − This is employedfor representing a 64-bit floating-point number and employed when floating-point values should be very large. For instance, 3.14159, 0.1, and -273.158. Bool − This represents a Boolean value that may beeither true or false. String − This is an ordered collection of characters. For instance, "Hello, World!" Character− This is a single-character string literal. For instance, "C"
Optional− This represents a variable that mayaccept either a value or no value. On a 32-bit platform, Int is the similar size as Int32. On a 64-bit platform, Int is the similar size as Int64. On a 32-bit platform, UInt is the similar size as UInt32. On a 64-bit platform, UInt is the similar size as UInt64. Int8, Int16, Int32, Int64 can be employedfor representing 8 Bit, 16 Bit, 32 Bit, and 64 Bit forms of signed integer. UInt8, UInt16, UInt32, and UInt64 can be employedfor representing 8 Bit, 16 Bit, 32 Bit and 64 Bit forms of unsigned integer. The below table shows the variable type, how much memory it holdsfor storing the value in memory, and what is the maximum and minimum value that can be stored in such type of variables. Swift is a type-safe language i.e if a part of your code is expecting a String, you are not supposed to pass it an Int. As Swift is type-safe, it will perform type-checks during compilation of your code and flags any mismatched types as errors. After compiling the above program, it will give the below compile time error. Playground execution failed: error: <EXPR>:6:6: error: cannot assign to 'let' value 'varA' varA = "This is hello"
Type inference will enable a compiler to conclude the type of a specific expression accordingly when it compiles your code, just by examining the values you facilitate. 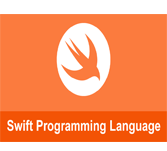 Swift employs type inference to work out the suitable type as shown below.